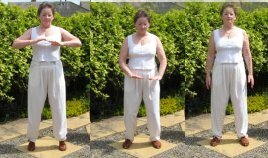 Some form of balancing or quietening the chi is usually used to finish off a qigong set. It helps to leave you feeling relaxed and calm. Confusingly, we have also seen it used at the start of a session - to help you become calm and relaxed to get the full benefit of the rest of your exercises - so the choice is yours. 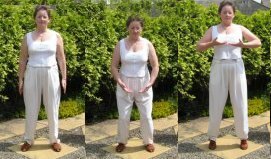 The exercise looks as though your hands are being pushed up by an expanding balloon of energy and at chest height you turn your palms over to press the balloon back down. back muscles - it has heel raises! Avoid going too high up on tiptoe - it's not essential and you could overbalance.